Need medical care in or near Lone Tree, Castle Pines, Littleton, Roxborough, Ken Caryl, Morrison? 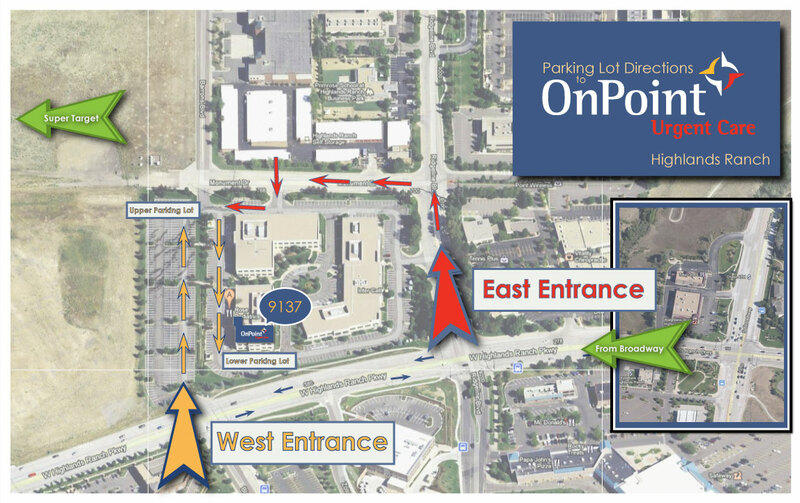 The OnPoint Urgent Care Highlands Ranch location is here to serve you on Ridgeline Boulevard at the corner of Blake Drive and Highlands Ranch Pkwy. From the East – C-470 W to Broadway exit. Left on Broadway and follow South to Highlands Ranch Parkway. Right on Highlands Ranch Parkway to Blake Dr. Turn R onto Blake Dr. and enter the upper parking lot on the R or proceed straight ahead and make a U-turn at the end of the upper parking lot to enter the lower parking level directly in front of the building. From the West – C-470 E to Lucent exit. Turn R on Lucent and proceed to Highlands Ranch Parkway. Turn L on Highlands Ranch Parkway and follow to Blake Dr. 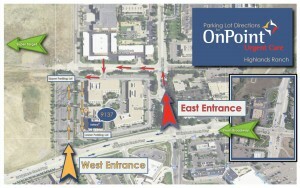 Turn L on Blake Dr. and enter the upper parking lot on the R or proceed straight ahead and make a U-turn at the end of the upper parking lot to enter the lower parking level directly in front of the building.